When it comes to presidential elections, there are fewer competitive counties, and more counties in which Democrats or Republicans hold overwhelming vote advantages, than at any time in the past three decades or so – on-the-ground evidence of the heightened partisan polarization that characterizes U.S. politics today. In the 2012 election, there were only 275 counties – less than 9% of all counties and county-equivalents in the nation – in which fewer than 5 percentage points separated Democrat Barack Obama and Republican Mitt Romney, according to a new Pew Research Center analysis of county-level voting data. 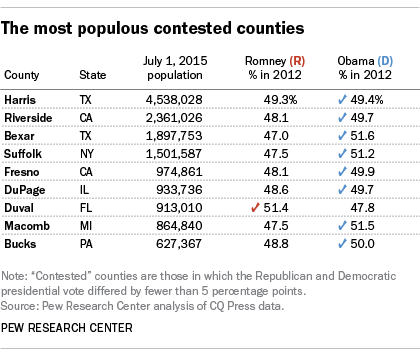 That was the fewest closely contested counties since Ronald Reagan’s landslide re-election in 1984. Closely contested counties aren’t, as you might expect, predominantly in the “swing states” that get the lion’s share of attention from presidential campaigns and the media covering them. While there were notable concentrations in 2012 in the upper Midwest and along the Pacific coast, closely contested counties were scattered across the country; they could be found in both strongly Democratic states (such as California and New York) and largely Republican ones (such as Texas and North Dakota). Except for a small bump up in 2008, the number of closely contested counties has been declining since 1992. At the same time, the number of counties where one party or the other holds an overwhelming partisan advantage has risen dramatically. For example, Romney won 70% or more of the 2012 presidential vote – our threshold for a “landslide county” – in 807 counties. That was more than any other Republican had won by such a margin since at least 1976, the first year of our analysis. Meanwhile, Obama took 70% or more of the vote in 105 counties that year, the most for a Democrat since Jimmy Carter’s narrow victory in 1976. 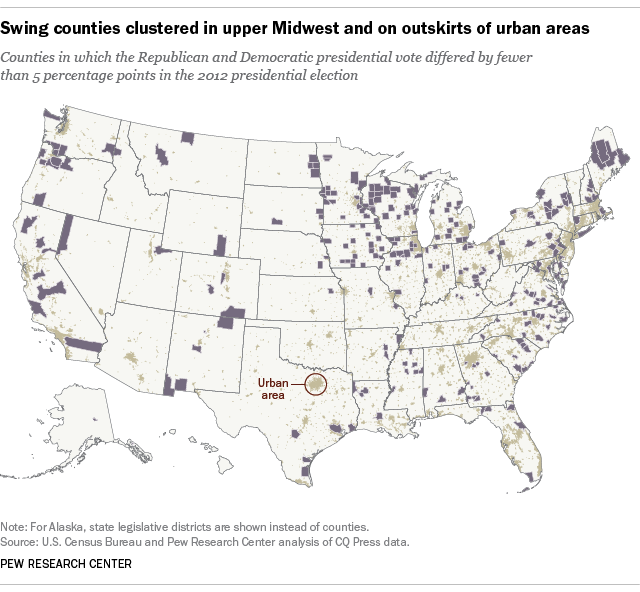 The growing number of counties dominated by one or the other major party reflects the clustering of Democratic- and Republican-aligned people in different places that’s been evident for some time now: As a 2014 Pew Research Center report noted, there’s a clear ideological divide both in the types of places people would like to live and where they actually live, with liberals preferring cities and conservatives favoring small towns and rural areas. Notably, Obama beat Romney rather comfortably in 2012 – winning by more than 5 million votes nationwide – while carrying only 713 (22.6%) of the nation’s 3,100-plus counties. The closely contested counties range widely in population, and Texas has both the largest – Harris County (which includes Houston), with a population exceeding 4.5 million – and the smallest, Kenedy County, with just 407 residents. The most closely divided county in the nation in 2012 was Pike County, Ohio, where Romney edged out Obama by a single vote (or less than 0.009 percentage points). For this post, we relied on county-level vote totals from CQ Press’ Voting & Elections Collection for every presidential election from 1976 through 2012, and 2015 population estimates from the Census Bureau. In 2012, votes were reported from 3,161 counties and “county equivalents” – parishes in Louisiana, legislative districts in Alaska, and independent cities in Virginia and a few other states (that total was slightly smaller in prior years). The Alaskan legislative districts were excluded from the population analyses because the relevant population data weren’t available at that level.